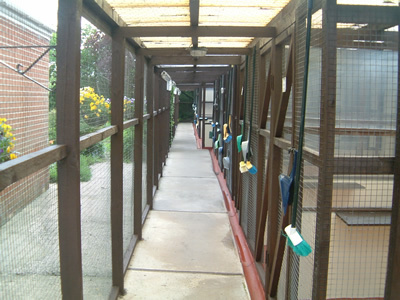 Cats are housed in spacious heated chalets with covered outdoor runs. Family pens are available for cats from the same family. Hygienic plastic beds with fleeces are provided although you may bring your cat's own bedding and toys or scratching posts if you wish. We stock most popular brands of wet and dry cat food and will feed your cat according to your specifications. You may wish to bring your own food if your cat is on a prescription diet. We are also happy to accept cats on medication. All cats must have an up to date certificate of vaccination against Feline Infectious Enteritis and upper respiratory infections (cat flu) and the certificate must be presented at the time of boarding. If for any reason you are unable to transport your cat, we offer a collection and delivery service to your door.